Camphill Scotland is the membership body for the 11 Camphill communities in Scotland. Our role is to build our members’ national profile and influence and to facilitate their development as providers of education and social care. Follow this link to find out more about us. We are proud to say that the care provided by Camphill services in Scotland is impressive. Taken together, the communities received 139 inspection gradings from the Care Inspectorate during the last 5 years (2014 to July 2018). Of the grades awarded 84% were either Excellent or Very Good grades. Read more about our sector leading care. Each Camphill community manages their own admissions process for both day services and live in support. Visit the Find your place page for contact details. The community will guide you through the application process. How many people does Camphill support? The 11 Camphill communities in Scotland support over 600 individuals with learning disabilities and other support needs through residential and day service provision. Placements have increased by almost 15% since 2015, and demand for places rises annually. Communities continue to make efforts to expand their services, whilst maintaining their high quality standards. Unfortunately demand often outstrips supply. What is the combined income of Camphill in Scotland? The total income of the 11 Camphill communities in Scotland for the financial year 2016-17 was approximately £28 million. It is estimated that in 2017 Camphill communities received around £22 million in funding in relation to care and support services, while income from trading was around £2 million. How many people work in Camphill? 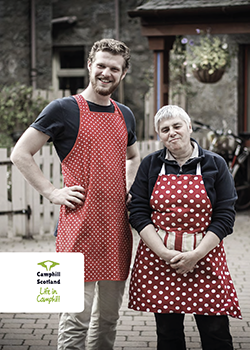 Over 1,000 people contribute to the work of the Camphill communities in Scotland. This includes over 160 unsalaried co-workers, who continue to follow the traditional Camphill vocational model, and over 190 short-term volunteers/Foundation students. How many local authorities does Camphill work with? The Camphill communities in Scotland work with 29 out of the 32 local authorities in Scotland. They also work with a number of authorities out with Scotland. Do Camphill communities provide out of authority placements? Camphill communities in Scotland regularly welcome local and overseas volunteers who want to work with people with learning disabilities and other support needs. Visit our Volunteering page for full details on how to apply, and find out what it’s like to volunteer with Camphill.